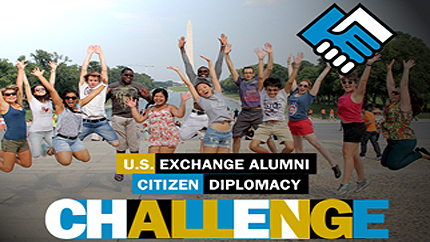 Beginning March 24, American exchange alumni will participate in the “Citizen Diplomacy Challenge,” which runs through June 9, 2015. The challenge is an opportunity for American alumni to showcase how U.S. government-sponsored exchange programs benefit us all, from how they advance U.S. foreign policies to how they strengthen the relationship between the people of the United States and foreign citizens. The alumni will earn awards points for sharing stories about the impact of their experience through activities such as presenting at local schools, writing op-eds, and creating short videos. At the end of the challenge, the alumni with the most points will receive recognition and awards including professional development trips to Washington, D.C. to share their ideas with State Department staff. INSPIRE. Share what exchange program means to them with contacts in their own community. EMPOWER. Give audiences the tools and know-how to apply to a program themselves. CONNECT. Broaden the network of Americans interested in potentially traveling abroad on an exchange program. Find more information at alumni.state.gov. If you have additional questions about the challenge, please contact alumni@state.gov. Are you ready to take the Challenge? Log into your International Exchange Alumni account and visit https://alumni.state.gov/CDC to participate.